Knowing how to make your own gunpowder means that you can keep on shooting no matter how long it takes for society to be rebuilt. It’s one thing to prep for the next hurricane or tornado or economic calamity. There are a lot of really basic skills and supplies that will get you through those situations, and pretty much anyone can acquire them. But the scenarios that are truly difficult to prepare for, are the ones that involve the total collapse of our society for any given period of time. That’s because surviving those scenarios requires you as an individual, to pick up the slack of everyone else in society. By that I mean you really have to do everything yourself if you want to survive. You have to grow your own food, heal your own wounds, fix your own gear, procure your own energy, and possibly even build your own shelter. When the commerce and infrastructure of society breaks down, you’re truly going to be on your own for a while. Fortunately, it wouldn’t take long for a society to start functioning again in some capacity. Working together, communicating, and trading is in our nature as human beings. We’d be eager to put the pieces of society back together again. But if a particularly cataclysmic scenario comes to pass, it could take years before our world is back in business. In that time, there would be one substance that would be in short supply, and that is gunpowder. For starters you’ll need three ingredients. Potassium nitrate, charcoal and sulfur. All of these ingredients should be ground into a fine powder if they haven’t been already. The ratio of these ingredients is 75% potassium nitrate, 15% charcoal, and 10% sulfur, and that ratio is by weight, not volume. These ingredients should be ground up separately before mixing. Grinding them together could cause an explosion. It should go without saying that throughout this process, you shouldn’t let any sparks, static, or open flames get anywhere near your materials. As far as mixing them together, first add a small amount of water to each ingredient to reduce the risk of combustion; just enough to give it a dough like consistency. Now you can grind them all together with a mortar and pestle (don’t use any utensils or containers made of metal). Most people will use a ball mill to both grind up the materials and mix them together. It’s a bit safer, and will make a higher quality powder. This moistened paste can then be pressed into a single solid mass, and as it dries you can grind it up again into tiny pellets. This is a process known as “corning.” The product this produces will burn better and will be a bit more stable and consistent, than if you just mixed all these ingredients together all willy nilly with a bowl and spoon. After that, you’re pretty much done. In an apocalyptic scenario however, making black powder is the easy part. What would be really challenging is attaining these ingredients in the first place. Charcoal would be the easiest, since it’s fairly easy to make on your own. Willow, soft pine, western cedar, and cottonwood trees are most commonly used for making black powder. Sulfur is bit trickier. Depending on where you live, you may or may not be able to get a hold of it in a grid down scenario. Fortunately black powder can still be made without sulfur. Simply mix the potassium nitrate and charcoal together with a 80/20 ratio. It won’t burn as well, but it will still work. Sulfur can also be substituted with iron-oxide (rust). Your most challenging obstacle will be finding the potassium nitrate. The only natural source of this material can be found in bat guano, and I’m willing to bet that you won’t have an easy time finding that. You’ll have to make your own. Traditionally this was done by what’s called the “French method.” You have to mix urine, manure, and straw together. Periodically, more urine is added and mixed over and over again over the course of several months to a year. Then water is poured through the mixture and filtered through wood ash, causing potassium nitrate crystals to appear, where they can then be separated. A more modern method involves a metal drum with a drainage valve near the bottom. A screen mesh is placed inside, and manure, water, and urine is dumped in and mixed on top of the mesh. You seal it up tight and let it sit outside for 10 months. Then you drain the liquid into a wood ash filter, and let it set in a shallow, wooden or plastic container to dry. Once the water dries, potassium nitrate crystals will remain. These aren’t the only methods though. There are countless more, so it would be a good idea to do some research and find something that works best for you. The Army’s Improvised Munitions Handbook has a recipe for making potassium nitrate that is a lot faster than what I explained above, and it also contains its own procedure for making black powder. As you can see, making your own gunpowder can be incredibly dirty and dangerous, but having this skill under your belt is certainly empowering. 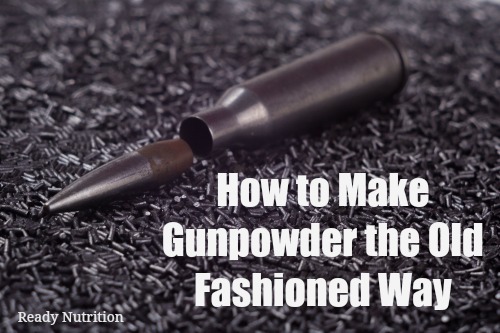 Firearms are among the most useful tools in a prepper’s arsenal, and knowing how to make your own gunpowder means that you can keep on shooting no matter how long it takes for society to be rebuilt. Black powder is also dirty burning. Semiautos won’t function long if at all. Lesser pressure lower velocity. It helps to have a reproduction muzzle loader. Another complication is priming and that is even more dangerous to make. Unless you get a flintlock. The best option is to stock up on modern powder and primers, lead, shells, etc. Not so hard, they could use chlorates for a primer although it’s dangerous and mercury or silver fulminate isn’t a big deal either. The thing is these are no harder than making good blackpowder. It takes more than following a recipe to get it right. I’ve had many years experience and wouldn’t recommend anyone just jump in at the sharp end of any of this without a lot of research first, even if they have a science degree. Best thing to use this for would be making explosives, most modern day rifles will not work with black powder and if you can get it to work you still have the primer issue. Best thing is for fireworks really. Not much bang in blackpowder,. on powder making as well. We have a saying in pyrotechnic circles. It takes lead balls to mill blackpowder. I suggest a cement mixer and cast yourself a hundred or so 1 inch diameter lead balls. These are the best and safest grinding medium. 24 hours grinding the ingredients, out the charcoal and half oxidizer together separately to the sulfur and other half oxidiser. That too needs 24 hours mixing. Then combine and mix with lead balls for another 24 hours. Now you have yourself something closer to blackpowder and you can start corning it etc. Much less than this and all you’ve got is what we call “Meal powder” and it’s way less powerful than it can be. For re-loading I’d suggest gun-cotton or ethylene glycol dinitrate. Much cleaner burning and no harder to do. Any smokeless powder cartridge will work with b.p. , you still need the means to reload the brass, make the bullets. A self loading firearm will work with b.p., it wont self load ,tho. You would need to cycle the action manually. Better off with non self loaders. looks like its time to order another 10k rounds of ammo. I’m not sifting through poop for rotten powder. Not digging in the stink for powder. I always have a few extra pounds of the store bought and I only reload handgun calipers.